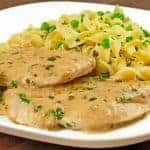 Boneless chicken breasts, sauteed in butter and topped with creamy pan sauce flavored with white wine, fresh tarragon and Dijon-style mustard are served alongside egg noodles tossed with butter, peas and fresh parsley. Gently pound the chicken breasts between 2 sheets of plastic wrap to a uniform thickness of about 1/2-inch, then season on both sides with salt and freshly ground black pepper. Heat 1-1/2 tablespoons of the butter in a heavy pan over medium-high heat. Add the chicken and cook until golden and just cooked through, about 3 minutes per side. Transfer to a plate and cover loosely with foil to keep warm. Add the remaining butter to the pan and reduce the heat to medium. Whisk in the flour and combine well. Cook, whisking constantly, until the flour is pale golden in color, 1-1/2 to 2 minutes. Add the wine and combine until smooth, 1 minute longer. Add the mustard and half-and-half and continue cooking until the sauce is creamy and smooth, 1 to 2 minutes additional. Stir in the tarragon and add salt and pepper to taste. Return the chicken to the pan, stirring in any juices that may have accumulated on the plate. Using tongs, turn the breasts several times to coat them with the sauce. Plate individual servings, spooning additional sauce over the chicken. Serve along with Egg Noodles with Peas and Parsley (see below).